Preparing a resume, putting together a job search portfolio, finding potential employers, interviewing, and generally advancing one's culinary career can be daunting. 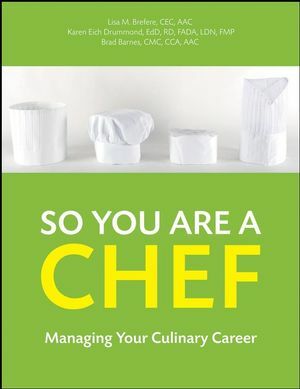 So You Are a Chef helps readers determine which culinary career path best suits his/her needs, set career goals, write up a resume, prepare a portfolio, contact prospective employers and interview for positions. Students are walked through the process of all this in the hopes of helping them achieve career success. 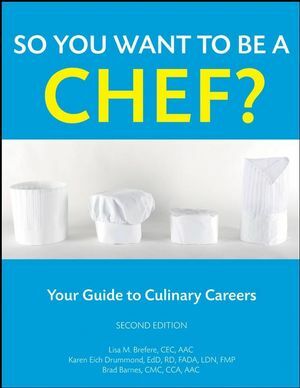 So You are a Chef covers everything from getting potential job candidates pass the 30-second test and win interviews to networking and becoming an active member in professional organizations. Lisa M. Brefere, CEC, AAC, is a Certified Executive Chef with over thirty years of experience. A graduate of the Culinary Institute of America, she is a member of the American Culinary Federation and the American Academy of Chefs and has been awarded the ACF Presidential Medallion for outstanding dedication to the profession. She has coauthored several books including Nutrition for Foodservice and Culinary Professionals. With her business partner, Brad Barnes, she cofounded GigaChef.com, an online tool for culinary professionals. Karen Eich Drummond, EdD, RD, FADA, LDN, FMP, is author and coauthor of numerous books, including Nutrition for Foodservice and Culinary Professionals and The Restaurant Training Program, both published by Wiley. Brad Barnes, CMC, CCA, AAC, is one of fifty-nine Certified Master Chefs in the United States. A graduate of the Culinary Institute of America, he is a member of the National Certification Commission for the American Culinary Federation and plays a pivotal role in revising culinary certification standards. A cofounder of GigaChef.com with Lisa M. Brefere, he has also coauthored the American Culinary Federation's Guide to Culinary Certification, published by Wiley.